This tool can find where a texture is reused across the other three Mass Effect games, making use of the many duplicate textures between the games. According to Qt's open source license, this program is licensed under LGPLv3. The Texture Mapper is a tool intended for texture modders. It can find where a texture is reused across the other three Mass Effect games, making use of the many textures that were reused between the games. The tool was originally made by myself to make the development of ALOT easier, and I am now releasing it along with the source code for everyone to use. There are tens of thousands of textures in the entire Mass Effect Trilogy (11 000 for ME1, 8 000 for ME2, 27 000 for ME3). Additionally, thousands of these textures are reused across several games of the trilogy. Sometimes Bioware uses exactly the same texture from one game to the next, and sometimes they just do some changes (downscaling, upscaling, changing colours, brightness...). Some textures are even reused multiple times in the same game with only minor differences. Each texture in the trilogy is identified by a unique identifier (a hash that looks like this : 0x0215D5EF). This hash is what modding tools like MassEffectModder use to find and replace textures. We have built a database of such textures for ALOT, partly using image comparison software, partly by comparing textures manually. Currently, around 7500 such textures have been detected, documented and organised into over 3000 groups of very similar textures. The complete list is available here. OKAY, BUT WHAT'S THE POINT ? The goal of the tool is to make the most out of the textures you made, by showing you where your textures are reused, in the same game or in others. You can also choose to have the tool automatically port all your textures to another game. An example : you select your textures from the Texture Mapper, and tell it to port them from ME3 to ME2. The tool will go through your textures, find the hashes within their filenames, and from this build a list of the duplicates in ME2 of your ME3 textures. 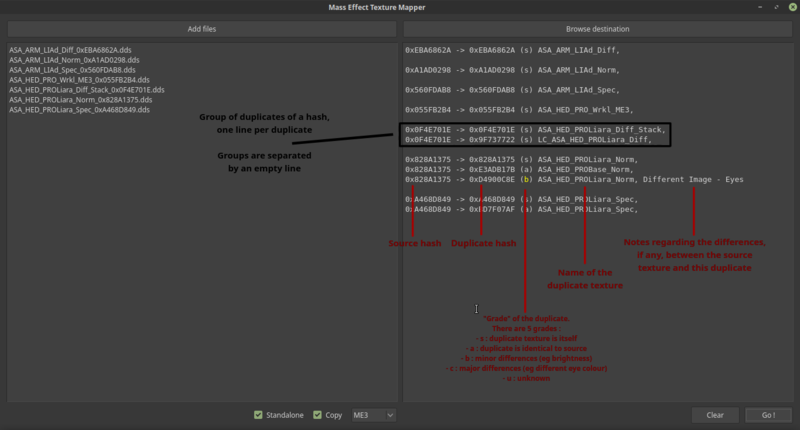 Optionally, it will also copy your textures into a ME2 subfolder, and rename the copies to their ME2 name and hash. NB : the tool can be used on Windows and Linux. It's written in C++ with Qt 5.12. 1. Browse for the files you wish to port from the top left dialog. 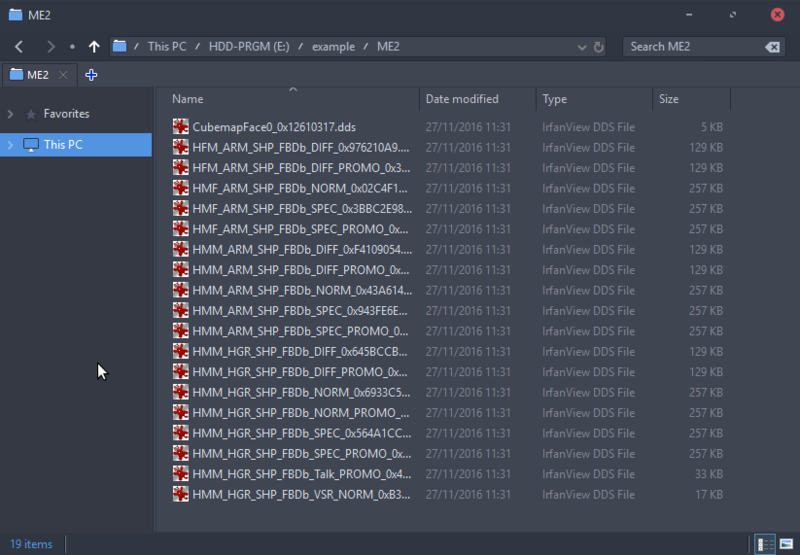 The selected files will be displayed in the left pane, one per line. Once you've selected files, you can't edit the left pane anymore, until you hit the Clear button. 2. Select the options you need. Standalone : show all the duplicates of a texture, including itself; otherwise show all the duplicates, excluding itself. Copy : makes as many copies of your texture as there are duplicates, and renames those copies accordingly. There will be no overwriting of the files you selected, the ported textures will be pasted in a subfolder named ME1, ME2 or ME3 depending on the game you next choose. 3. Select the game you wish to port your textures to. The tool doesn't care from which game your hashes actually come from, only in which game it should find matching duplicates. You could mix hashes from ME1, ME2 and ME3 and it would work just fine. 4. Select the folder you want the ported textures to be copied into from the top right dialog. By default it is set to where you selected the files. 5. Click Go. The tool will match your hashes with the database, and display the results in the right pane. If you selected the copy option, it will copy the matches in a subfolder.